This past week in #CPChatNow was buzzing as always. Members talked about how #DisabledPeopleAreHot, plans for CP Awareness Month, incompetent nurses, and controversy with Walmart and an employee with CP. This is #CPChatNow Co-Host, Devin Axtman, taking you along for the ride on this week’s recap. The hashtag #DisabledPeopleAreHot swept Twitter the past week. Many #CPChatNow members posted pictures for the hashtag. Here is a newcomer to #CPChatNow, Lionel Menchaca. This brings us to our Extend-The-Conversation Question: What is the worst thing a healthcare employee has said to you? Please join us each Wednesday at 8 Eastern on #CPChatNow. Occasionally the live cerebral palsy Twitter chat #CPChatNow encounters quieter nights. The February 13th, 2019 chat ended up as one such occasion. Nevertheless there still remained enough to highlight and package into your weekly recap. To do so I, co-host Zachary Fenell, am here. Like previously mentioned, the evening started off slow. After awhile #CPChatNow regular Seth joked that the chat felt emptier than a Sears. His comment brought out my co-host Devin Axtman. Devin admitted to thinking the day was Tuesday. Oops! Someone who I knew would miss the chat included long-time regular Hannah. In fact Hannah asked I share a message from her. Earlier in the day Hannah underwent surgery. Although she wanted to join the fun, she found herself too exhausted. Extremely understandable, if you ask me. Therefore while waiting to see who else might stop by, Seth and I used the time to discuss a common interest beyond cerebral palsy. An ability to bond over topics besides cerebral palsy shows a deep connection within our community. For Seth and I we discussed professional wrestling. Major League Baseball (MLB) represents another non-related cerebral palsy common interest multiple people inside our community share. When the chat began picking up, MLB discussion emerged. However, this time the dialogue held ties to cerebral palsy. To confess, I brought up the MLB subject. Recent news coverage by ESPN’s Jeff Passan intrigued me. Passan reported the sports juggernaut renaming their “Disabled List,” the “Injured List.” Long-time regular Jen greeted the news without much enthusiasm. Elsewhere #CPChatNow co-host Jorge Otezia shared a different current news development. Jorge linked to a press release announcing a merger between the Reaching for the Stars Foundation and The Cerebral Palsy Foundation. You can bet in the coming months we at #CPChatNow will keep you informed regarding the merger and the impact had throughout the cerebral palsy community. Stay tuned to our Facebook page for that. Answer below via a comment. Then go like our Facebook page. Finally, mark your calendar and come join #CPChatNow each and every Wednesday on Twitter, starting at 8pm ET. Until then, remember. Don’t blend in. Blend out! #CPChatNow included various different topics last Wednesday including: future employability, Valentine’s Day coming up, and even member’s favorite breakfast cereal. This is #CPChatNow Co-Host, Devin Axtman, taking you along for the ride on this week’s recap. This brings us to our Extend-The-Conversation Question: Have you ever had fears related to your employability due to your disability? 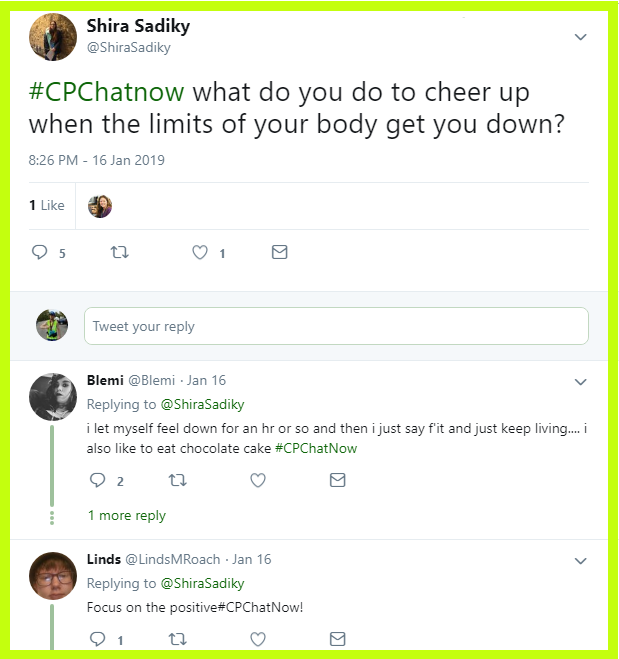 Wednesday, January 30th, 2019 the cerebral palsy Twitter chat #CPChatNow put on full display arguably their greatest virtue, community. 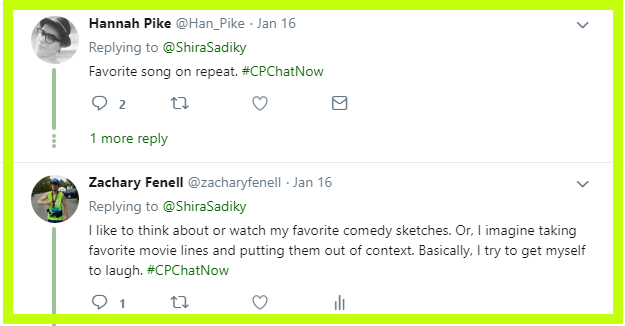 At least I would make said argument and I am #CPChatNow co-founder and co-host Zachary Fenell. Seemingly I am not alone in this opinion either. After a rough week, long-time #CPChatNow regular Hannah Pike turned to the chat seeking a little normalcy. Beyond the usual names, our community also welcomed a new member January 30th. Newcomer Sean decided to accept an invitation from #CPChatNow regular Shira to join the chat’s fun. Immediately Sean engrossed himself into the dialogue, asking participants to share their favorite portrayal of a person with CP in movies or TV. An effective conversation starter! Besides opening our metaphorical arms to Sean, our community also warmly greeted a returning familiar face. Jorge Oteiza managed to find the time within his busy schedule to drop by and say hi. A schedule that includes job hunting, finishing his last semester at college, and handling graduation thoughts. New and familiar faces alike enjoyed each other’s company. We celebrated accomplishments. Ciarán shared his continual handwriting improvement. Progress Sean called “proof that persistence is key.” Persisting forward in our recap, additionally to toasting each other’s accomplishments, members in #CPChatNow supplied one another encouragement. Recalling almost falling earlier in the day Shira commented about avoiding falling on her face, saying “Yay, me?” Both Sean and I reassured, yes indeed. Yay you! Sean reasoned getting away without a broken bone or chipped tooth equals a win over gravity. Similarly I noted these small saves prevent serious harm. Therefore Shira deserves to feel proud. Surely we all experience such moments anyways. As the week’s extend-the-conversation question, share yours! Respond in the comments. Let us celebrate our small victories together. Join our community live on Twitter every Wednesday starting at 8pm ET. This past week in #CPChatNow was bustling as always. This is #CPChatNow Co-Host, Devin Axtman, taking you along for the ride on this week’s recap. First, we have to congratulate #CPChatNow member, Timmy Le, for getting accepted to a PhD program at the University of Massachusetts. Various members talked about the positives and negative impacts of social media. Zach and I talked about negatives like getting addicted to “likes,” but also positives like having access to information you would not have like parents finding community. This brings us to our Extend-The-Conversation Question: Do you feel social media is a net negative or positive in your life? Please share your answers in the comments and join us each Wednesday on #CPChatNow on Twitter at 8 Eastern. Participants in the weekly cerebral palsy Twitter chat #CPChatNow adopted a problem solving attitude Wednesday, January 16th, 2019. I am co-host Zachary Fenell, here to package that advantageous mindset into your weekly recap. One troubling issue community members offered solutions to involved how to cheer up when your body’s limits get you down. Regular participant Shira raised this subject, asking our community “What do you do to cheer up when the limits of your body get you down?” Long-time regular Blemi said she lets herself feel down for about an hour before saying “F’ it” and moving on. She also mentioned eating chocolate cake. Meanwhile Linds, known within our community as The Positivity Princess, advised Shira to focus on the positive. Elsewhere my co-host Devin Axtman provided a contrasting tip. 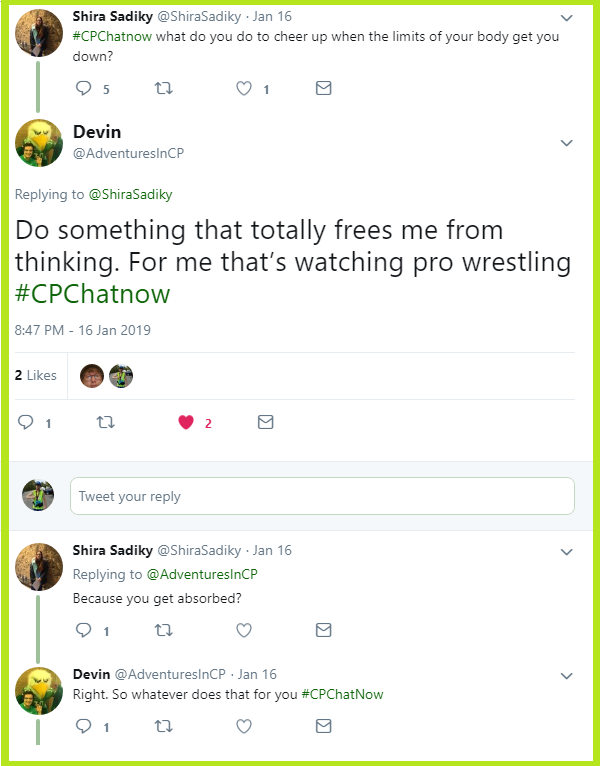 Oppose to focusing on anything, Devin totally frees his mind by doing something that does not require him to think, watching pro wrestling. Other community members mentioned additional entertainment outlets. Well documented music lover Hannah Pike listens to her favorite song on repeat to cheer up. Personally, I think about or watch my favorite comedy sketches. Sometimes too I use my imagination, taking favorite movie lines and putting them out of context. Essentially, I try to get myself to laugh. What about you? I am appointing Shira’s question the week’s extend-the-conversation question. Answer “What do you do to cheer up when the limits of your body get you down?” Reply in the “Comments” section! Another problematic topic our community discussed neutralizing during the January 16th Twitter chat included avoiding letting winter bum us out. Since Linds brought up the subject, I asked her how she prevents winter from getting her down. I possessed curiosity because winter challenges me. Conditions decrease my ability to walk places, costing me some independence. Linds credited her walker for helping to improve her mobility throughout the season. Her response left me contemplating whether I should use my cane more this time a year. Leave your answer in the “Comments” section! 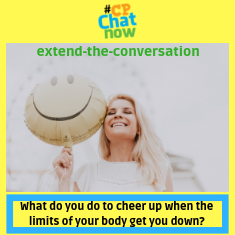 Speaking of topics to contemplate, remember to contemplate and answer the week’s extend-the-conversation question, “What do you do to cheer up when the limits of your body get you down?” Respond below in the “Comments” section. Then plan to join us on Twitter each and every Wednesday starting at 8pm ET. Until then, remember. Do not blend in. Blend out! This past week in #CPChatNow was a happening as always. As you might imagine, New Year’s resolutions were a hot topic. Members also talked about accessible seating and watching the ball drop. Amanda shared an unfortunate experience of accessible seating not being guaranteed at a concert she wanted to go to. This is all too common unfortunately. This brings us to our Extend-The-Conversation question: What are your 2019 New Year’s Resolutions? Please join us at #CPChatNow on Twitter tonight at 8 Eastern!